Initially, the door carried the only functionretention of heat in the house, so people are more concerned about the component than their appearance. Modern technologies allow to perfectly fit the interior doors in the interior of any style and direction, without forgetting about their functionality. The most popular on the market doors receivedsliding design. 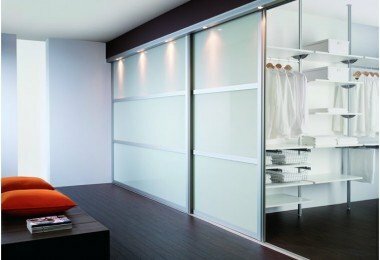 Installation of sliding doors allows you to make room design uniqueness and originality. They make it possible to expand the space of the room significantly, without requiring additional space for opening the valves, as well as making the area around them, in accordance with the general style. The first generation of sliding doors representeda very thin walls, stuck in the runners and cause only irritation. It is for this reason that many are still hesitant to replace more conventional hinged design. It is also very much a myth deters consumers about the complexity of a procedure such as installation of sliding doors with their hands. Still, most of the population of our country is trying to avoid calling a specialist at home or the additional costs caused by the payment of his work. the possibility of combining adjoining rooms. 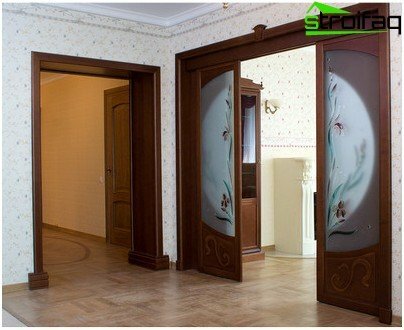 Sliding door device such that the slitsbetween the frame and the canvas can not be avoided. Therefore, such design have much less noise and heat insulation properties. They practically do not insulate the room from the noise, there was in the next room. These doors have a slightly higher price. As a result of improper installation or due to poor quality of the sash mechanism can move unevenly on the runners, which can cause them to jam. Care must be taken to availabilityspace on the side door, which door leaf moves. 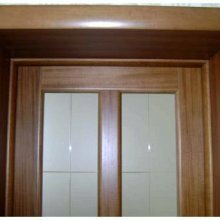 Place the cabinet or some other dimensional objects near the wall can only be provided if the door comes in a special pocket. Otherwise, the cabinet can only be put at a distance constituting at least 100-150 mm. This, in turn, reduces the usable area for which most often afoot installation of sliding doors. The lack of a wall with a pocket door cloth - it can not be used for fixing of wall lighting, paintings, decorative elements, as well as for the installation of switches and sockets. In the bag will accumulate a lot of dust, which is extremely difficult to remove. 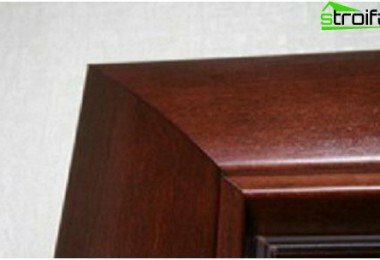 Quite often in a niche, in which hidden flap, there is a blockage of the sliding door leaf due to the skew rollers. Tip: It is better to provide for the possibility of removal on the one hand a niche under the canvas of the sliding door. This will help avoid the problems described in paragraphs 5 and 6. Therefore, before you decide to replace conventionalSwing construction on sliding should carefully think over, weigh the pros and cons and have only to decide, is it really necessary. Installing sliding interior doors are not socomplex as it itself usually. Maximum reliability and high quality of construction depends entirely on the accuracy of the installation work and the utmost precision all the necessary dimensions and calculations. First you need to decide what kind of a sliding door you would like to see in his house. visible structure moving along the wall. system uses both the above ways mounting. This type of door is the most reliable and convenient in operation. Council: It should be noted that the price of the door largely depends not only on its type, but more from the material quality and type of accessories. 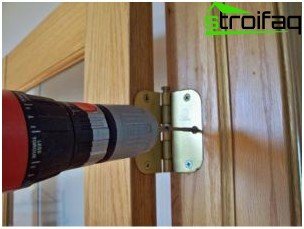 That is, by replacing expensive trim, door handles, locks and rollers to cheaper counterparts, you can significantly save. Of course, the entry doors in a special pocket allows you to save some space of the room, but it requires additional work and the destruction of the wall near the doorway. Council: mount blade can not only breaking the wall, but also to establish an invoice construction of plasterboard. As a result, the length of the room is reduced to about 100 mm, and you can avoid a rather complicated procedure. accessories (special locks and handles). Frames made of MDF with various toning. Frames made of aluminum profile. Is light and durable construction, it is absolutely not afraid of humidity, allow for the lack of decorative elements, as they can be painted in any color or anodized. 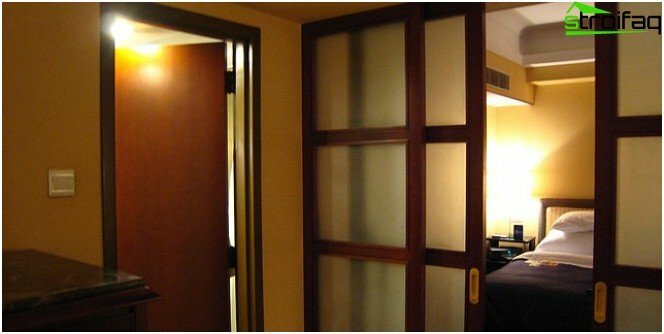 Doors made of tempered glass (frameless construction). Suitable mainly the style of "high tech", ideal for the allocation of negotiating areas and damp room. 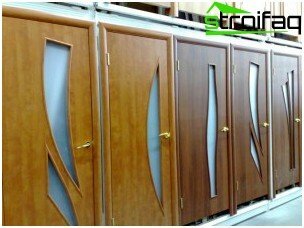 Of course, the door with a wooden frame are more expensive, but they have a higher thermal insulation. The mechanism used to implementmovement of the sliding door, consists of one or more guide with roller carriages serving fastening the door leaf. The guide is generally used as the aluminum profile. The rollers are made of a special polymer material, highly resistant to abrasion and damage. The rotation is carried out anti-friction bearings, which ensures ease of carriage travel. Interesting: Fittings for sliding systems has a number of distinctive features. Hands should always be recessed; otherwise, they will interfere with the door. Regular direct lock will not be able to close such a structure, it must be hooked bolt. A wide range of door panels allowscarry out a variety of options of interior design. Do not use fabric made of solid wood as well as the severity of this material leads to distortions of the whole structure, which leads to a decrease in smooth progress. Important: sliding door should be possible to facilitate through the use of lighter materials such as aluminum. If the door weight exceeds 70-75 kg, it is best to install on each of four or more rollers. Before you begin to assemble interior sliding systems, you need to prepare all the materials and tools that will be required during installation. dry wooden beams 50-50, the width of which is twice the size of the same door. Tip: to the door leaf is perfect has come, carefully follow the doorway measurements and increase the linear dimensions (width and height) to seventy millimeters. To perform any complicated options(Installation mnogostvorchatyh doors, glass having a very large weight pocket or equipment in the wall) it is better to invite these experts, because any error during installation can badly damage your pocket. Man, never having affairs with sliding design, will only be able to install a simple door-coupe. If you have purchased a ready-made kit, the installationI will not take no more effort or time, as it will have all the necessary accessories provided by the manufacturer. But if you decide to create a sliding system according to their desires preferences, the packaging will have to pick up yourself and it is very difficult to do this job for the first time, to avoid mistakes. Let's try to make this installation guidesliding doors that allow a novice to quickly and accurately perform all the necessary work. Get together, you need to limit the care and precision. Installation should begin with the opening. We measure the height of the opening at three locations: on the left, middle and right, and a width in three places: at the top, at the center line and the bottom wall. Next, check the verticality, squareness and straightness of the parties concerned. If the design provides for framing, you should measure the minimum and maximum wall thickness, necessarily conducting measurements in the corners of the aperture, and not only on the sides. For ease of understanding we divide all the further process into simple steps. You must first remove the old door hinges, carefully remove the trim on both sides, after the dismount doorframe. If it is well secured and will not impede the free movement of the valves, it is possible to leave it, it will be a continuation of the wall. Now you need to carefully align the wall,Stopper all cracks and crevices. There should be a clear opening dimensions (height, width, and thickness), you never have to speak of the bricks or aerated concrete, gypsum board should be cut. Check the upper part of the doorway and on the floorparallel to each other (tolerance less than 5 mm) and horizontal. With the help of a plumb line check the side of the opening hand, there may be deviation of no more than 5 mm to 2000 mm. The greater evenness of the walls you can achieve, the more tightly the door leaf will adhere to them. If the old box is removed, theinstall a new one. Alone, it is very difficult to handle, so it is best to invite a partner. Set box in a doorway, and align it with the small wedges. Adjustable angle with respect to the location of the construction of floors and walls, moving or pushing it wedges. Fix the box to the wall with screws. Screwdrivers are working very carefully, because any, even minor, damage can lead to tragic consequences. Once ready door frame,presses the door leaf to the opening and mark with a pencil on the wall of its upper level. Now we perform the same procedure, but by setting the web directly into the doorway. This should be done in case, by some chance the plane of the floor is flat enough. If the resulting line is horizontal, measured fromher 70 mm up and spend another feature. It will set the guide rail. Put to the marked line prefab wooden beams and fix it with screws as tightly as possible, regardless of the flatness of the wall. To do this, use as many screws as needed. Now to the bottom end of a wooden beamWe attach the rails. First, loosely fasten the guide with one hand. 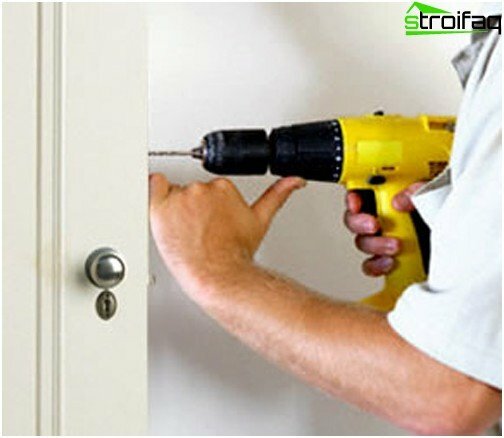 To accurately determine the location of the screw, the thickness of the door need to be divided in half and add 3-5 mm required to ensure the free leaf stroke (distance from the wall). The same operations are carried out, and on the other side of the bar. Before the final rail mounting Always make sure there is sufficient distance between the door and the door wall. Important: The guide rail should be strictly straight, not allowed the slightest bend, regardless of the curvature of the walls and beams. Now you can finally fix guide. Then the bolts are screwed into the carriage with rollers, with their ends have a few to look out from the hole. Each carriage plant in the prepared rail and convinced of their free movement. Tip: do not need anything to lubricate the inside of the rail. Along the edges of the guide rail set travel stops, making sure that the rubber dampers looked inside. Getting to the design of the lower end of the slot door. 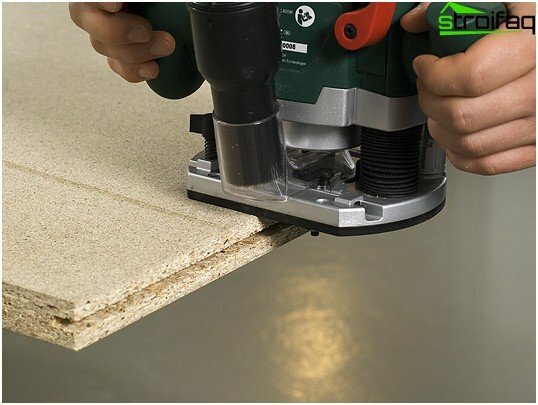 For this retreating 15 mm from the edge of the sash and drill two holes on each side of 7 mm diameter and 20 mm deep, between which a groove is cut in the middle strictly designed for the bottom rail. Perfectly smooth groove hard to do, even with the router. Beginners may be advisable to install rails or U-shaped profile. 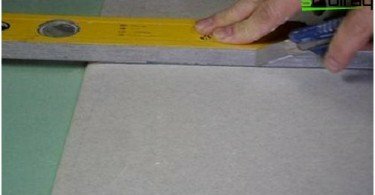 the groove depth should be at least 18 mm, and the width2-3 mm larger than the width of the bottom rail, usually a box or a knife. 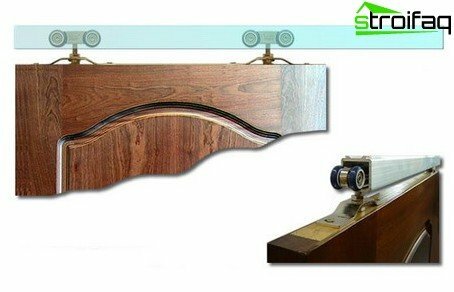 Since self perfectly flat recess is problematic to do, even with an electric drill or a router, it is preferable to install a U-shaped profile or the two rails. Mounts to the carriages must be secured exactly in the middle at a distance of not less than two millimeters from the lateral flap edges. In this semi-circular cutouts on the brackets must be rotated to the wall. To install the door leaf will require twohuman. After the oversight of the web to combine rail carriage bolt right to cut the bracket located on the same side. It is necessary to lift the door slightly to make it. The end of the bolt factory in the mounting hole of the adjusting nut and washer, which should stay out of the bracket. Fix the bracket bolt carriages, but not completely. Now set lower guide into the cutoutlower end. This is easily done by slightly shifting the lower part of the wall. Return the blade to the horizontal position and move it to the open state. Pencil should mark the opening of the greatest length. 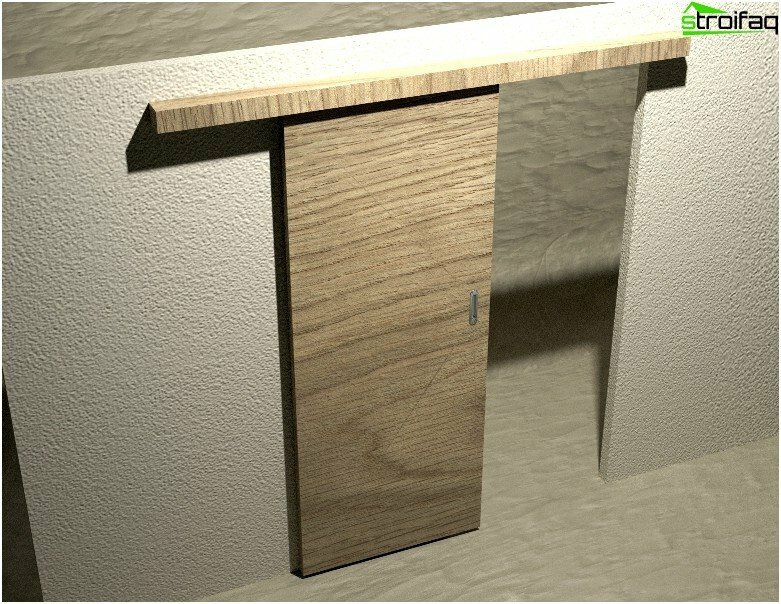 To adjust the gap between the wall and the doors need to reject the lower part of the door leaf to achieve it and mark on the floor the position of the knife. Important: The gap between the wall and the door leaf must not exceed 5 mm. After removing the nuts carriages, remove the canvas and attach the bottom rail to the floor using two self-tapping screws. We combine the groove with the guide and then hungdoor leaf, is also not fully tightening the nuts. 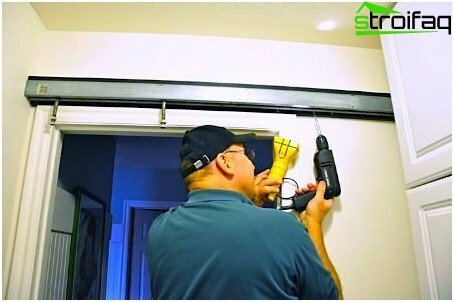 After you install the necessary clearance between the floor and the door leaf by tightening or loosening the nut on the carriages anchoring adjustment bolts while holding the adjusting bolts from turning. Install decorative flip over casingthe upper guide and masking it in line with the overall style of the room (you can paste over the same wallpaper, paint or paint in the walls of the room are painted). Attach the handle and lock.